Myths and legends involving quests and journeys are found in many cultures. Throughout history, people have told stories of heroes and heroines grappling with monsters, evil spirits, the elements and the gods. The stories have been expressed in song, dance, literature and art, and given rise to countless myths ang legends. They mirror the dreams and hopes of women and men for exciting adventures beyond their everyday experience. This book includes ten quest stories from around the world, showing how they have been interpreted, retold and passed down the centuries. Some of the illustrations are reproduced from illuminated manuscripts in the collection of the British Library. 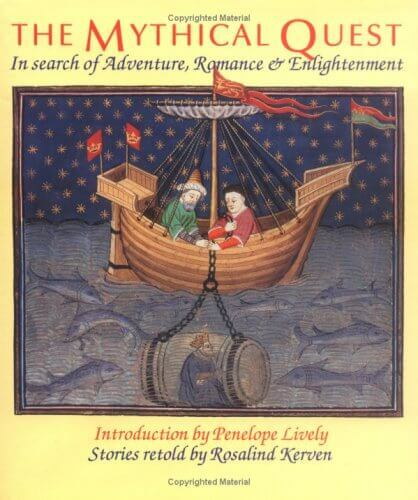 The introduction, by Penelope Lively, discusses the nature of quest myths and how they have permeated the storytelling of so many cultures.